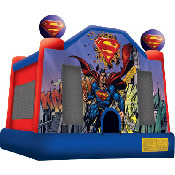 Superman Jump - Bounce House & Party Rentals | Inflatable-Kingdom.com Jackson MS.
Planning super hero theme party? Well rest assured this Superman themed bouncer is perfect entertainment for your smaller children. This moonwalk features an awesome picture of The Man of Steel. The space jump shows Superman breaking through walls in the spectacular artwork, with his cape blowing in the wind, the Man of Steel's "S" logo above and the great city of Metropolis below. 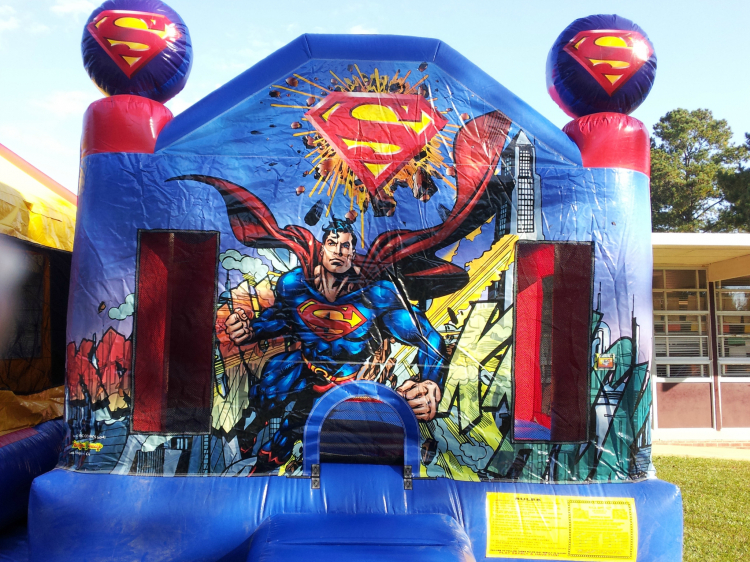 This Superman bouncer has the signature blue and red theme and more "S" logos flanking the top of each bounce house pillar. This jump will bring the soon-to-be super heroes running to get inside. This space jump is perfect for kids to jump alongside friends all day! This bounce house is the perfect way to combine fun and a healthy activity. Children enter and exit via an entrance ramp encourages kids to enter one by one. Also, our 360-degree mesh windows allow parents and guest an awesome view of children jumping in a safe and clean environment. This makes for some awesome photo opportunities. Go ahead and add this awesome space jump to your cart. This bouncer rents often and very quickly.